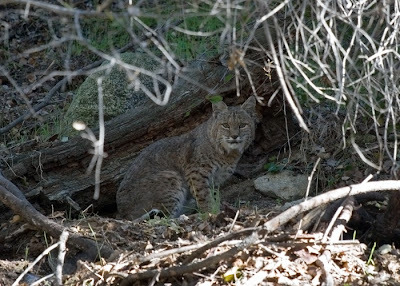 This bobcat crossed the road in front of me as I was heading up into the park. They don't usually stay when there are people around but went partially up a deer trail and sat down. He/she gave me a lot of time to grab my camera and take some photo's. Other than wondering what that crazy human was doing, he/she didn't seem at all concerned about me.